Jump To078: Princess Leia's Interrogation079: Millennium Falcon Pursued!080: Hyperspace Hurty Eyes081: 3d Holographic Space Chess082: "It's not wise to upset a Wookiee..."083: "Let the Wookiee win"084: The Destruction of Alderaan085: "Your eyes can deceive you"086: "Hocus Pocus"087: "Chewie, jam its transmission! "088: "That's no moon..."089: "Chewie, full reverse! "090: "It's a Tractor Beam!091: "Would you look at the size of that thing? "092: "Was this trip really necessary? "093: "C'mon you creeps!" Millennium Falcon Captured!094: "I forgot how much I hate space-travel"095: "She lied—she lied to us!" And we’re off: Part 6 begins. 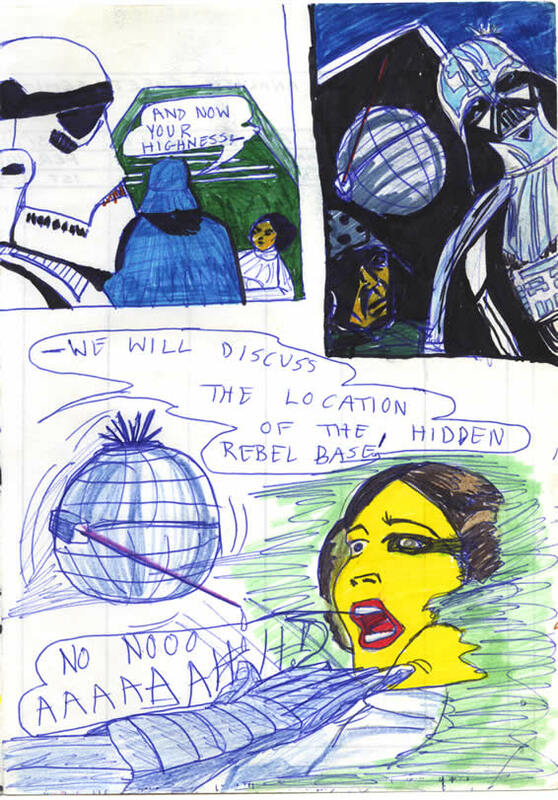 The interrogation of Princess Leia, from around 1978. This scene in the film always brings a smile – oddly enough! Are you injecting – or skewering me?” Look! A floating robot turnip! Are you injecting – or skewering me? The Marvel one looked quite different! George Lucas said he wanted things in the film to “look familiar” – even though it was an other-worldly space-fantasy movie. People could relate to it – strange as it all was: it’d connect. Thing is though, that interrogation droid – or whatever it is – is very impressive, scary and futuristic; but it has this laughably familiar plastic syringe attached to it! Same as the ones we have in our own Galaxy. And is that all it does? All that anti-gravity, robotics, weird humming and it just runs into you with a needle? Hey, maybe Vader’s too squeamish to do it himself! Look at the size of it! It’s not so much a needle – more of a wedge. Ah that’s nice, he gently pulls her sleeve down for the injection. 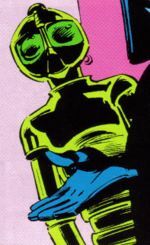 The artwork here was mostly ripped-off from Howard Chaykin’s Marvel comic adaptation, but the reflective surface of Vader’s helmet is quite well observed. Chaykin didn’t have the floating ball droid thing so I had to do that myself. Floating metal turnip – more like! A green highlighter marker has been used here. Dad brought some home from work and I was just amazed by their effect. The black is done with a thick permanent marker. The, by now familiar yellow Simpsons skin colouring is due to the ‘flesh’ marker running out. In the Death Star detention block, a stormtrooper stands to attention, helmet in close-up side-profile. Vader stands behind and between him and Princess Leia. Vader has opened the door of her prison cell and speaks, "And now your highness --"
Just a shot of Vader, a Death Squad/Star Commander and the interrogation droid hovering. No dialogue.
" -- We will discuss the location of the hidden Rebel base!" he shouts. And with this, Vader pulls back Leia's gown from her shoulder, and the droid hovers in, massive dripping syringe at the ready. "No nooo" Leia screams, "Aaaaaaaaahhh!"